Wakefield Trinity Wildcats have signed Warrington Wolves prop Anthony England on a two-year deal. 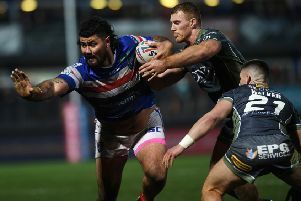 The 28-year-old moved to Wolves from Featherstone Rovers in 2014 and went on to make 39 appearances in two seasons at the Halliwell Jones Stadium. England, who played with Stuart Dickens at Featherstone, is looking forward to reuniting with the Wildcats’ assistant coach and playing at Belle Vue. He said: “I’m made up to be signing for an up and coming Super League club. “I’m really looking forward to getting into training with the boys and excited about the new signings.